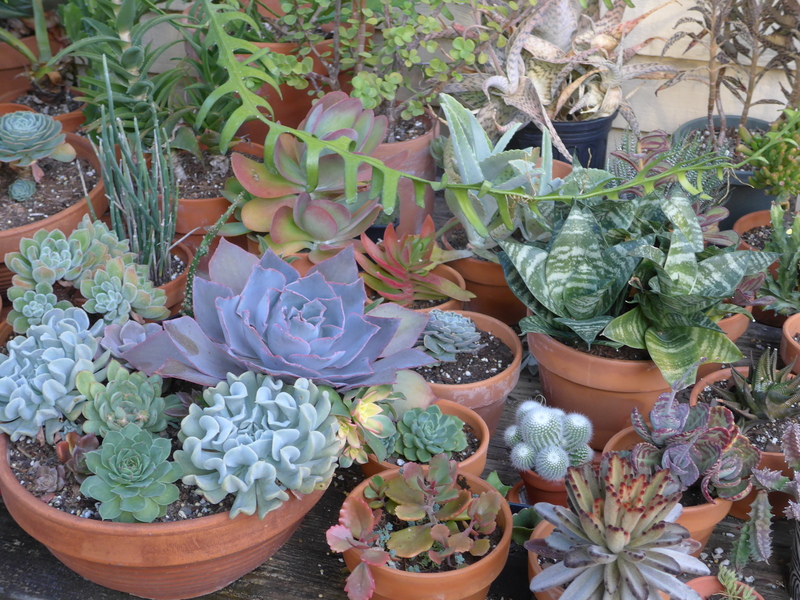 It is always easy to find a gift for a gardener. Plants, tools, statuary, magazine subscriptions, books… the list is endless. This year my garden and I received some very special treasures. 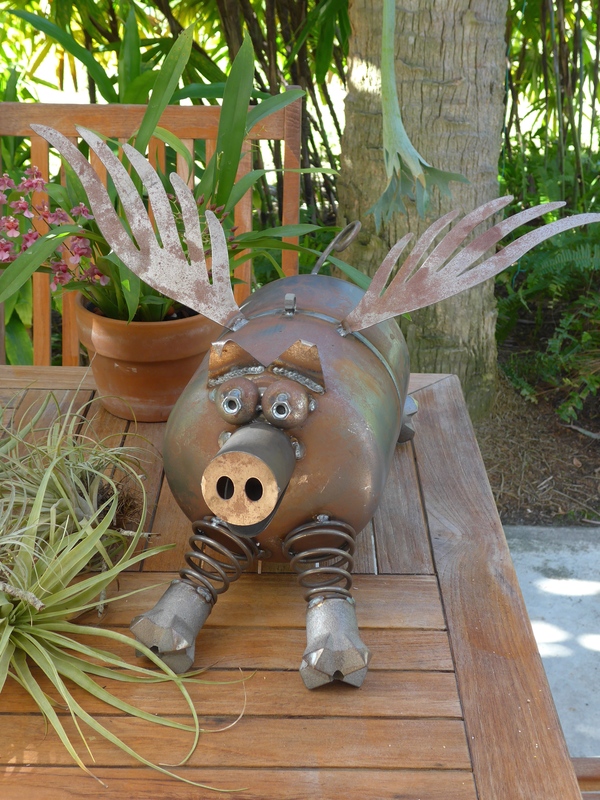 My kids and grandkid gave me this wonderful flying pig which was crafted in St.Petersburg, FL. I have named her “Primrose” after one of my favorite early spring flowering plants. Here she is wintering over in the south where she is enjoying the lovely weather…. she’ll come north to the garden in April and meet her namesakes. Another lovely gift I received was a Hellebore from my dear friend Kim. I had it in the house for awhile but since we’ve had a few days of warm weather, I decided to plant it outside. It was yellowing a bit indoors but now seems happier outside, and I love looking out the window at something which is flowering this time of year. The third special gift I received was a new green birdhouse made by my sister Betsy and her husband. My Dad built green wren houses for my kids 25 yrs ago, but the houses have finally rotted away after much use. Now I have a special replacement.. can’t wait to see who moves in this spring. The gray and murk continue here in the north country. I escaped for a bit last week though when I spent six lovely days visiting my family in Florida. 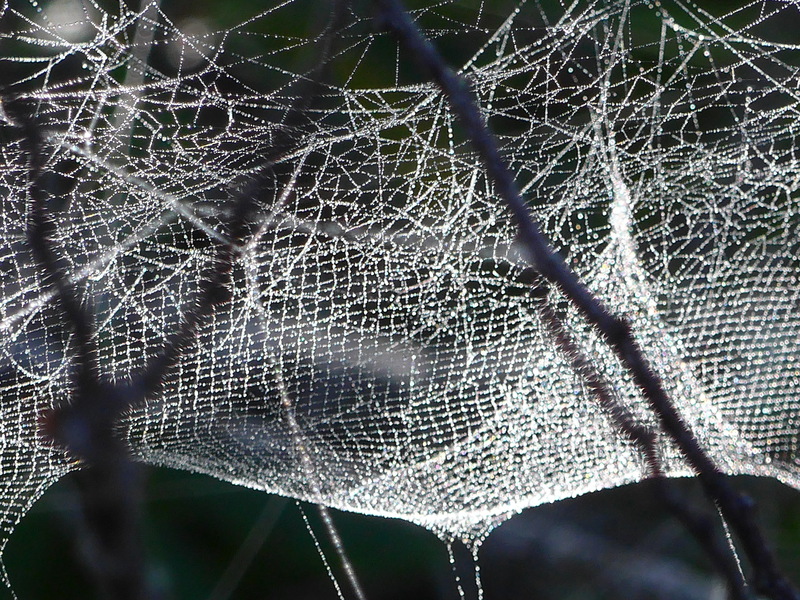 I snapped these spider webs one morning while out walking. 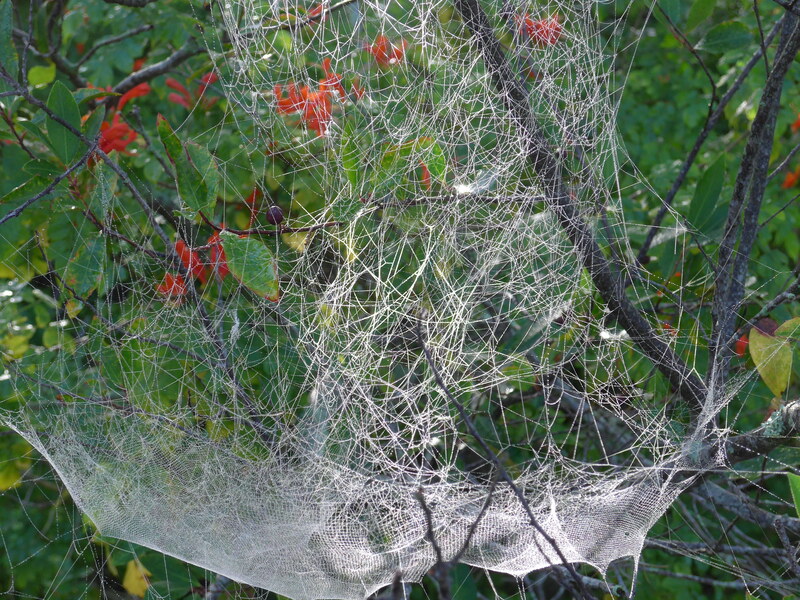 They might be made by sheet web spiders or perhaps made by bowl and doily weavers. I didn’t see a spider so I can’t tell for sure. The patterns are incredibly intricate. I thought the morning dew on them looked very Christmasy. I think I mentioned before about the wonderful Garden Bloggers Bloom Day that many gardeners participate in. My garden in Massachusetts is sleeping. I am visiting my son, daughter in law and granddaughter in Florida for a few days.. perhaps you’d like to see what’s blooming in their garden. The dark days are here. It doesn’t get light until 6:00 am the sun goes down at 4:15 pm. The beautiful snow we had has now mostly melted and what remains is dirt encrusted frozen chunks left from the plow. Christmas decor is popping up all over town though, and the lights and color are most welcome. I have some of my decorating done, but the real tree will be done next week. Last week I put up my sparkle tree. I got the idea from my sisters who live in northern Vermont. They bring in a big branch, cover it in lights and suspend it from the ceiling. Then they hang crystal, glass, white , gold, and silver ornaments on it. The whole room just glows. I have a lot of those ornaments that I used to put on my fresh tree but now I put them on my sparkle tree. My branch is upright – usually in an old sap bucket – this year I couldn’t find it – must have stashed it away somewhere and so I used a wooden wastebasket as a base. The branch goes in the base – I fill it with rocks, small hand weights, gravel and make sure its real sturdy. Then I wrap strings of tiny lights all over the branches, hang the glass icicles, vintage ornaments, crocheted snowflakes, etc. and plug it in. The darkness disappears.. Let there be light. My garden club does a terrific job beautifying our small community. We have 46 active members and take care of many of the “commons” and other areas in our small New England town. We also do some work at the Virginia Thurston Healing Garden in nearby Harvard, MA. http://www.healinggarden.net. The last couple of weeks we’ve been out cleaning up the gardens for the winter and putting up some seasonal decor as well. Here we are at the Hollis St triangle on Main St.